Edwards Audio IA7 review | What Hi-Fi? 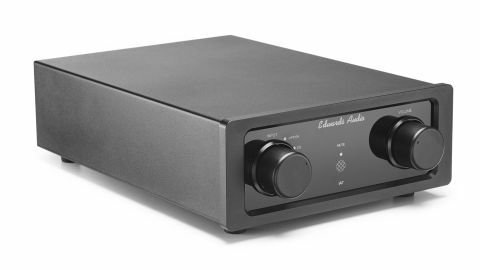 If we could describe this Edwards Audio IA7 stereo amplifier in just a single word, that word would be robust. A full-bodied sound packed in a distinctive chassis, the IA7 makes a decent dent in a fiercely competitive category, with ‘robust’ succinctly encompassing the IA7’s powerful, muscular and energetic characteristics. Seeing an Edwards Audio amplifier is like greeting an old friend with a new haircut. Overall, it’s the same familiar sturdy, half-width black metal box used across Edwards’ amplifier range, but the look has been refreshed by a different backlit LED colour adorning the front panel. On the IA7, blue LEDs light up important features such as inputs, model name and whether the amp is on mute or not – all of which are easy to see at a glance – as well as give a splash of character to an otherwise plain rectangular box. The workmanlike design isn’t as sleek as Audiolab’s 6000A, but the IA7 is solidly built and has a reassuring heft. Two control dials – one for selecting inputs, one for volume – work smoothly and the half-width design is appealing for those with limited space. We’d make sure the amp has plenty of ventilation though, as it can get hot when playing. Inside, Edwards Audio has improved the linear power supply and transformer of the IA7 (which is based on the original IA2-R amplifier), with a claimed 80W of power going into an 8ohm load. Edwards Audio has stuck with its all-analogue approach: you’ll find three line level inputs and a 3.5mm auxiliary input for connecting sources. There are preamp and record outputs, and even an option to add a moving-magnet phono stage. Our review sample came without and costs £850, while the model with the MM phono inputs costs a reasonable £900. The IA7 comes with an oval-shaped remote control that works fine for adjusting volume, although you have to aim it straight at the amplifier. It doesn’t work well from an angle, which is worth considering when positioning your hi-fi in your room. There’s nothing workmanlike about the Edwards Audio IA7’s sound: this is a big, muscular and, most of all, fun sounding amplifier. The IA7 has bags of energy and punch, and its penchant for really deep, lush basslines is extremely satisfying. This smooth, full-bodied approach is clear of any sharp or bright edges, making it an easy listen right from the start. This is an amp that enjoys playing the music thrown at it. Basslines are joyfully deep, whether it’s the funky, squelchy textures in Sbtrkt’s Wildfire, the taut thrumming in Fleetwood Mac’s The Chain, or the all-encompassing crescendo in Hans Zimmer’s Inception score. They reach low, with every thump and wallop landing with a powerful and solid impact. But the IA7 isn’t a one-note meathead. It’s tuneful, too. Those basslines have layers of detail and texture, and the IA7 is dynamic enough to let songs soar and dip with ease. Songs are given a big playing field, too, with the IA7 offering an open, wide soundstage that offers excellent stereo imaging. Vocals sound bold and focused, and while the overall sound could be cleaner and crisper, the IA7 veers on just the right side of being a punchy and smooth listen. It’s an appealing approach, but Edwards Audio is up against fierce competition from the likes of the Award-winning Rega Brio and its stablemate, the Elex-R. Those amplifiers deliver music with greater finesse and clarity, and sketch out notes with greater precision and rhythmic drive. And while the £599 Brio can’t match the IA7’s muscle and scale, it’s subtler in the way it handles dynamics and detail. In comparison, the sense of drive and momentum in songs like Eminem’s The Way I Am isn’t as strong through the IA7. Massive Attack’s Paradise Circus should sound exceptional – with ethereal vocals and an iron-like grip on the complex rhythm – but the IA7 needs a little more subtlety and precision to get to that stage. What the IA7 does admirably, however, is manage to get across the feel and intent of a song. From the attitude of Eminem or Nirvana, to the wistfulness of The Unthanks, it has a great grasp on musicality and simply has more fun than most other amplifiers at this price. And it’s that quality that makes the robust IA7 such a joy to listen to.